I’m moving a bit ahead in the story, but not far. It’s the evening of the day of the big fight in town. Jake is having dinner at Beau’s. Jed comes to see him there. They talk. We pick things up in the midst of a conversation about Marisa’s and Jed’s relationship. I looked up from the remnants of my dinner. Thanks for dropping by and, as always, thanks for any feedback you feel inclined to leave. If you’re a fellow Snippet Sunday author, please don’t forget to visit your peers’ blogs to check out their work too. This onyl works if we all support each other. 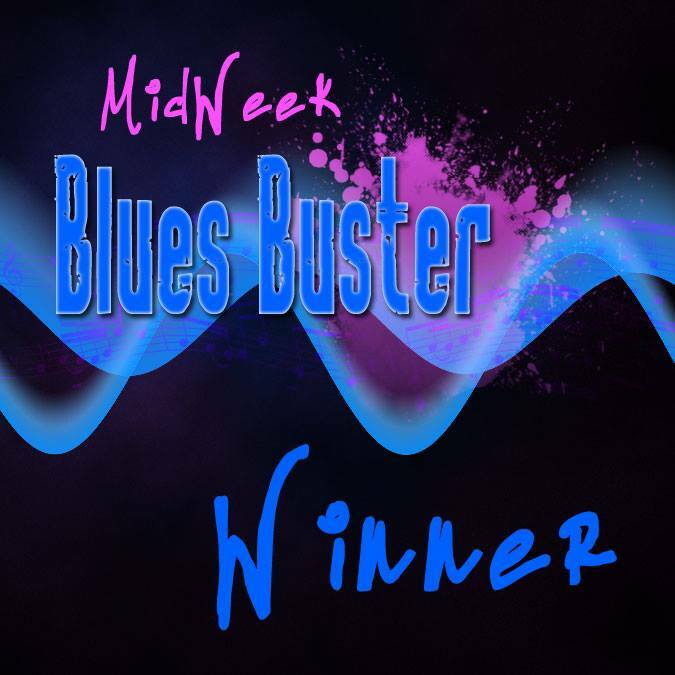 Welcome to the Mid-Week Blues-Buster Flash Fiction Challenge, Year 2, Week 52. Week 52. Know what that means? Two years. We made it to two years… Yay us? I wanted to choose something by a really big artist for Week 52. I figure that The Who is big enough. The tune is… “Eminence Front”. I also wanted a big time Judge… and boy did I get one in the Mortuary Mama herself… Ruth Long! The challenge opens the moment you read this post and runs through Friday May 29th. Okey then… the legacy of he recently departed blues great, B.B. King, garnered a whopping five entries. Good thing we’re all about quality over quantity at the MWBB. Three great B.B. King songs for inspiration this week. My hat is off to all our writers this week, so glad you showed up for some blues inspired writing. With five entries we end up with one winner and one runner up. Runner Up: Cara Michaels – Untitled I love this little scene. The two characters were clear and I immediately wanted to know why she couldn’t sleep, why they were in a hotel, why he would worry about her and when were they gonna get down to bizness. ‘Cause clearly there is some awesome sexual/emotional tension between them. Ultimately I was left wanting to read more…which is always a good thing. Winner: Bullish – To Have And To Hold Such a wonderful view into how we struggle with these very human and mundane challenges and how we come up short day in and day out which isn’t remotely surprising. What’s so surprising is our capacity for love and compassion in the face of all those challenges and shortcomings. Made me smile. Thanks for letting me judge. Mazel tov to our Winners. Thanks to our writers & readers, and thanks to Judge Mona Bliss. See you on Tuesday for another thrilling episode of the Mid-Week Blues-Buster. “All right then.” He took another look at the Olds, seemed about to speak, then thought better of it. He pointed at my battered right hand. Aches began to register in all of the muscles I’d used in the fight. I gave my arms a good stretch. “You got any idea what just happened between Jed and Marisa?” I asked. He chewed on his lower lip for a few seconds, then looked away. He looked at me the way you look at a dog you thought was housebroken. Thanks for stopping by and, as always, thanks for any feedback you feel inclined to leave. Welcome to the Mid-Week Blues-Buster Flash Fiction Challenge, Year 2, Week 51. We lost a music legend last week with the passing of blues master B.B. King. B.B. is just too big a figure in the music world to pick just one song for a prompt so we’re doing something special in his memory. This week there will be three song prompts. You can choose one, choose two, or find a way to tie in all three if you like. This week’s Judge is author, theatre addict, and music aficionado… Mona Bliss! The challenge opens the moment you read this post and runs through MIDNIGHT PACIFIC TIME on Friday May 22nd. With five entries this week we’re clinging to the edge of relevance on the flash circuit here at the MWBB. Still– I’ll take quality over quantity and we got five strong stories for Judge Mark Ethridge to sort out. OK. Managed to reach some form of decision, using some process even I don’t understand. So. Here. Five entries this week. All of them deserve a winner’s badge, but unfortunately, that’s now how this works. I’ve only got 2 awards. One winner, and one runner up. So, I get to be totally subjective, and random, and pick which stories get what. @MissBliss – As I read, I found myself thinking, “Wow. I wish I could describe things anywhere near as well.” Phrases of the story stuck in my head, like, “I knew I’d feel my heart cracking into a mosaic of loss and despair.” Maybe in a century or two, I can learn to write such phrases. Just, wow. Love how you captured this moment in time, this calm before the storm. @blurosemd – The joys of a family curse. Is it an illness? What’s up with the father? I can see the daughter making like Miss Marple, snooping around, looking for clues, trying not to get caught. @harmony77uk – You leave me wondering if Danny will come back as a ghost and seek revenge for his wrongful death. It’s also a grand place to end the story. Where the bad guys win, and the hero dies. @caramichaels – Ah, hell. Such a wonderful place. And it seems even hell has mysteries, and deals with searching for the truth. “This is Hell, kid. Nothing stays secret here.” What a line. Interesting personification of the Reaper. Like how the MC knows when the Reaper smiles, even though the Reaper is only a skeleton, and can’t smile. @bullishink – That’s one prehistoric ‘gator. One old crone in the swamp. One mystery best left alone. And one human who can’t leave puzzles unsolved. Makes for some well crafted conversation. “There is a foul breath at my back,” indeed. Thank all five of you for writing. As for who I give the winner and runner up to. Well. That’s a tough one. After arguing with myself for a while, I have managed to come to some form of decisions. If I were to continue the arguments with myself, I might change my mind. But, for now, as I write this, here’s what I end up with. Runner Up – @caramichaels – Because. Hell. What a concept. Winner – @harmony77uk – Because. The bad guys win. And the MC dies. And that makes the story different. Congrats to the winners. And if I could, I’d hand out awards to all five of you. This week’s snippet picks up pretty much where last week’s left off. Jake, fresh off the fight with the big guy who’d sucker-punched him and grabbed Marisa at the hotel, is discussing the matter with the local constabulary, in the form of Deputy Norris. I looked over his shoulder down Main Street. Jed stood on the corner, with his back to us, talking to one of the men in work clothes. The corners of his mouth moved as he bit back whatever he was about to say. He rested his hands on his hips and gave me an earnest stare instead. I was starting to like Deputy Norris. He raised his hat and rubbed at the reddened spot where brim met forehead. Thanks for dropping by to read this… and thanks for any feedback you feel inclined to leave. And don’t forget to check out the other Snippet Sunday authors. Welcome to the Mid-Week Blues-Buster Flash Fiction Challenge, Year 2, Week 50. This week’s song prompt is by the gritty, grubby American troubador… Steve Earle. This week’s Judge is a true master of flash fiction. Say hello to Mark Ethridge! The challenge opens the moment you read this post and runs through MIDNIGHT PACIFIC TIME on Friday May 15th. And when I say that I mean more than four of you!!! So… Not much in the way of entries for this week’s MWBB. Still, Judge Theresa Johnson Miller had a job to do. Four entries,in which quality trumps quantity, which means only one Winner and a Runner-Up. The winner is Neighbors by Bullish. The writing was very well done and I really felt like I knew the characters. I loved the simple lasting affection between two such different people. The runner up is Ceilings by Boyd Miles. Insanity can be hard to write and I think he did a great job of it. Thanks to all of our Writers (all four of you) and readers, and thanks to Judge Theresa Johnson Miller. See you next time for another thrilling edition of… the Mid-Week Blues-Buster! We’re moving ahead a little with this week’s snippet. Last week’s saw the law come calling on our friend Jake. This bit is from the ensuing conversation. Deputy Norris nodded toward my Oldsmobile and gave me a smile packed with professional courtesy. “Why don’t we continue our conversation over by your vehicle,” he said. We crossed the street, stopping near the hood of my car. He ran his eyes over the dents and scratches in the paint. They matched the dents and scratches in me. I dug out my wallet and handed it to him when he finished inspecting the car. He handed the wallet back. I put it away. I must have made a face. The wind carried an understated salt tang on it. The ocean, even in the middle of town, made its presence known. Thanks, as always, for stopping by to check me out, and thanks for any feedback you feel inclined to leave.